Though I personally try to bring forth a different perspective of this Albanian reality and life, I obviously do not tend to focus on the worst aspects nor do I want to exalt the evils of our society. But obviously there are harsh realities and issues that still affect us in ways that bring about dire consequences even to our very lives! The recent violent protest in Tirana, which was interpreted as an attempt to try and overthrow the current government was an extreme example of that harsh reality in Tirana, Albania. I would have liked to say that I was the one to say that quote, but nevertheless its truth was harshly realized by the death of three protesters on the street. Albanian democracy is still weak and irresponsible with regard to human life and the well-being of its people. Short-sightedness and selfish gain, continue to plague most of our decision-making be it in the political, social or economic spheres of our society. But further worst is the fact that the development of democracy can be so easily thwarted by acts of violence and the loss of lives! [slideshow id=5]I am against violence, and more so against the use of violence to further political goals of any political party. But even more so at a time when there is true suffering all around us. A time when the economy is weak and is faced with natural and political catastrophes. But I guess that old saying holds true: the people deserve their leaders! At least the leaders that they choose to follow! It is a historical fact that the poorer social stratas of any society are often misled and misused for political reasons. And Albanian political parties have no problem resulting to violence to sustain their position, be it on the part of the opposition or the current government. The recent protest was a vivid example! There is another saying, which says: “those who do not learn from history are destined to repeat its mistakes”. 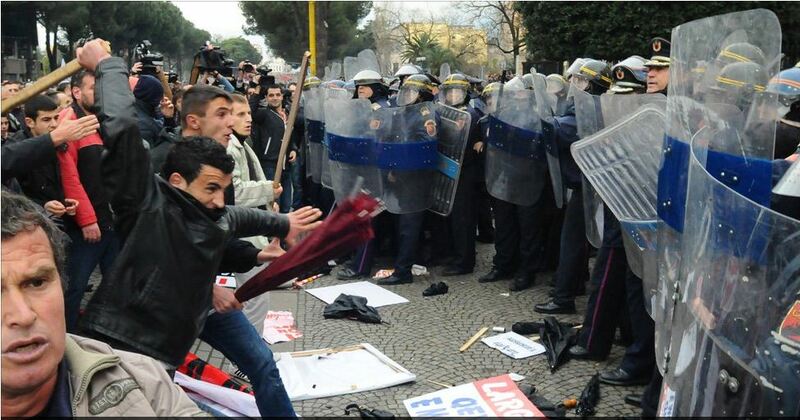 And for me the violent protest in Tirana is a sad reminder that we as Albanians have a short memory. But even sadder than that is the fact that the same people who got the country in this situation are the same people that we continue to elect and call our leaders. Thus we continue to pay the consequences of bad leadership and forget about what should matter most in terms of the long-term well-being and prosperity of the people.